Added support for the official Android MIDI API (minus Bluetooth). 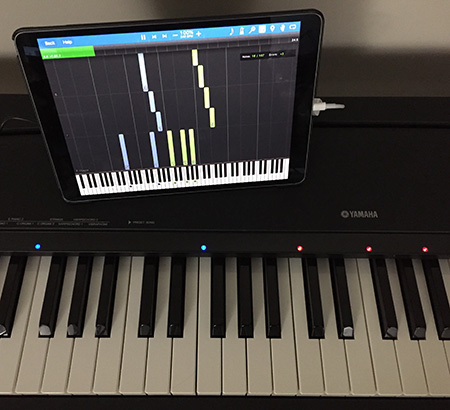 This means you can now connect devices to Synthesia running on a Chromebook! Free Play is now available in the locked version of Synthesia as a time-limited demo. Added octave shifting buttons to the keyboard zoom (magnifying glass) popup. The "Proprietary 1" key light mode (for "The ONE" hardware) is now available on all platforms. Synthesia now knows how to use both light colors available from The ONE Piano Hi-Lite (blue for left hand; red for right hand). When the "Settings --> Advanced --> Instrument Change Messages" is set to "Filtered-out", both Free Play and the song setup screen now disable instrument selection (to drive home that it wouldn't have had any effect anyway). Added "Title.LongRecentNames" advanced setting to include composer and arranger in the entries of the "Recent Songs" list on the title screen. It is disabled by default. The "UpperFilters Fix" utility now asks if you'd like to create a System Restore point before applying the fix. Disabling the "Graphics.Vsync" setting now works on systems with Nvidia hardware. Fixed a handful of crashes/bugs related to the sheet music page-flip effect. The MIDI reset that happens between screens now respects the "Settings --> Advanced --> Instrument Change Messages" option. Songs containing a tempo change of zero BPM were causing all sorts of trouble. Skipping forward in a song no longer sends ALL the "note off" messages between the two time points. "Note off" messages are only sent for the currently-active notes. That took much longer than expected. I'm like an expert Bluetooth programmer now... despite there not being any new Bluetooth features in this preview! Anyway, onward to the better Windows 10 and Android synth. That's the other half of Synthesia 10.5 (which will hopefully go much faster) and then we're back on track with Synthesia 11. Hi, I may have a bug to report: When I try to change the music library (Settings\Songs\[+ Button]) it says "had trouble reading from folder!" Also, it is very slow to do this. I have copied 4664 version into a subfolder of Synthesia. I copied version 4393 was copied and run in the same way (a synthesia sub-folder) and was working fine. I ran 4393 again to check, and it allows me to add folders. Then I reopened 4664 and the folder that I added in 4393 was already there! There is the workaroud at least. I can reproduce the bug. Thanks for the report! We'll get that fixed in the next dev update.